Matthew 23:37 reads: " O Jerusalem, Jerusalem, thou that killest the prophets, and stonest them which are sent unto thee, how often would I have gathered thy children together, even as a hen gathereth her chickens under her wings, and ye would not!" The image of a hen gathering her chickens under her wings resonated with me, I felt sometimes as a mother hen gathering up her chickens. 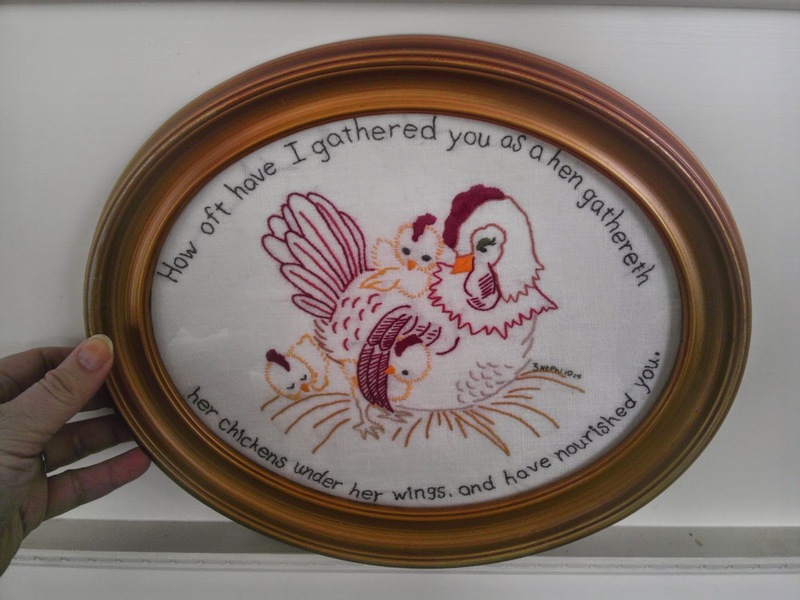 I loved that they were 'chickens' not 'chicks,' and as is the case with most pet names I started thinking of the kids as the "chickens" and myself as the hen and one day I started calling them chickens. Now when I come home I call out "Home Chickens!" or when I need the kids to come I cry "Chickens!" I will tell them that they are "silly chickens." 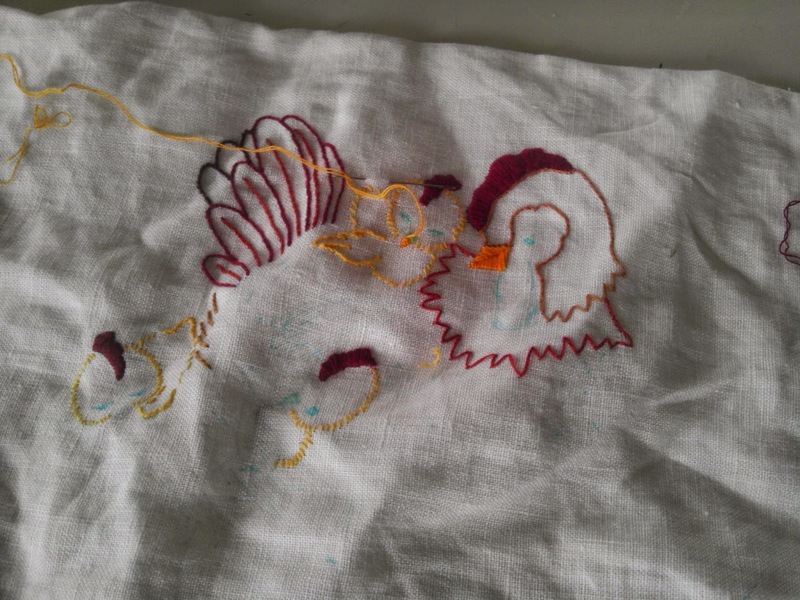 Before the Christmas sewing madness I had the idea to make an embroidery for the kitchen of a hen gathering her chickens I let it percolate for a while and I began in earnest after Margaret's baptism. I made swift progress but halfway through I put it down and picked up the knitting needles to make a few necessaries. I may have gotten back to the embroidery soon (the frame was sitting on the sewing table to remind me) or it could have become another member of the projects to finish someday box. And then came General Conference, the 184th Annual General Conference of the Church of Jesus Christ of Latter-Day Saints. I hope you had a chance to watch it. If you didn't never, fear, you can watch it here. Saturday, right out of the gate Elder Holland came out swinging and he addressed all of my concerns and fears and struggles. How I love having apostles of the Lord speak directly to my heart! Such comfort and solace and strengthening courage! Then he quoted the scripture about the hen that gathereth her chickens under her wings, my heart skipped a beat and the kids looked up and Eddy exclaimed "That's Mom's favorite scripture!" Then the scripture was repeated again! The same reaction and I think it even happened a third time. It doesn't matter because by that time I KNEW that I needed to finish my embroidery right away. By the afternoon session I was hard at work and it was finished by Sunday night and framed but Monday at lunch. That is a fast turnaround for me. "O ye people of these great cities which have fallen, who are descendants of Jacob, yea, who are of the house of Israel, how oft have I gathered you as a hen gathereth her chickens under her wings, and have nourished you. And again, how oft would I have gathered you as a hen gathereth her chickens under her wings, yea, O ye people of the house of Israel, who have fallen; yea, O ye people of the house of Israel, ye that dwell at Jerusalem, as ye that have fallen; yea, how oft would I have gathered you as a hen gathereth her chickens, and ye would not. O ye house of Israel whom I have spared, how oft will I gather you as a hen gathereth her chickens under her wings, if ye will repent and return unto me with full purpose of heart." I chose the 3 Nephi reading of the scripture for my embroidery because in this passage it feels to me less like the Lord chastening his people and more of a reminder and invitation to us to remember that the Lord is always waiting for us to run into his arms for shelter against the buffetings of the world, for protection, for sustenance. He loves us, he is waiting for us, he will continue to wait for us again and again.